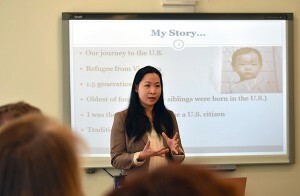 Dr. Van Ta Park shares her background as a Vietnamese refugee and the role of personal connection in improving resources for dementia caregivers. 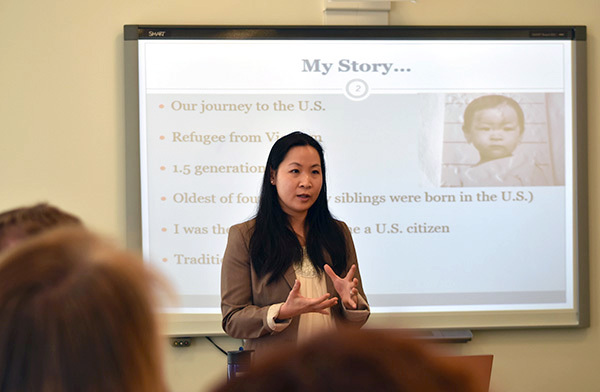 As a refugee from Vietnam, Dr. Van Ta Park, an associate professor in the Department of Health Science and Recreation in the College of Applied Sciences and Arts, has a unique understanding of the challenges that face family caregivers. Ta Park has received a grant for $150,000 over three years from the Alzheimer’s Association to develop culturally-tailored mental health resources to support Vietnamese American dementia caregivers. San Jose has one of the largest Vietnamese populations in the nation. Among Vietnamese Americans, 68 percent are foreign born and 87.5 percent speak another language other than English at home. Prior research, including Ta Park’s, have shown that Vietnamese Americans are less likely to utilize mental health services compared to the general population, which is concerning as caring for a family member with dementia is associated with higher rates of depression than in the general population. William Fisher, the CEO of the Alzheimer’s Association Northern California and Northern Nevada Chapter, presented Ta Park with a check for her grant on Feb. 19. He noted that grant proposals are selected through a peer evaluation process, with the top eight percent of proposals receiving funding. Ta Park was one of only two scientists to receive the Mentored New Investigator Research Grant to Promote Diversity (MNIRGD). She will be working with her mentors, Dr. Dolores Gallagher-Thompson and Dr. Gwen Yeo from Stanford University, School of Medicine, and will work closely with the Vietnamese American community. Before receiving the Alzheimer’s Association grant, Ta Park received funding for a qualitative study from SJSU and her college that allowed her to interview mental healthcare providers who work with the Vietnamese population to understand the way they used existing services and the best way to reach clients. “I found consistently that they recommended incorporating spirituality and the need to ask personal questions as well as allowing them to ask personal questions,” Ta Park said. Through this input, Ta Park is developing a face-to-face, cognitive behavioral skill training program that will meet at the homes of Vietnamese caregivers in small groups, with five to six caregivers at a time. The participants will be divided into two groups: 30 people in the control group will receive existing resources from the Alzheimer’s Association website that have been translated from English into Vietnamese, and the other 30 will receive newly developed resources that have been created specifically for the program. All participants will be recruited through community organizations that serve local Vietnamese residents. To support the research, Ta Park has recruited bilingual and bicultural Vietnamese SJSU students to be research assistants.